The Dandelion editors seek submissions on the theme of THE CONTEMPORARY for their forthcoming issue. When will the contemporary end? When did it begin? Contemporary cultural production and questions about the nature of contemporaneity itself have become dominant in recent scholarship but just what is ‘the contemporary’? What type of creative and scholarly work is being done under its aura? Should we apprehend the contemporary as a noun, offering definition and order to a discrete period in history; or is it rather as an adjective, traced with a particular structure of feeling, an interdisciplinary apprehension to what is happening Now and an anxiety towards what comes next? We seek submissions that address how the social, political and aesthetic dilemmas that characterize our present are made manifest in the twenty-first century’s cultural production. For instance, if the contemporary is the cultural logic of neoliberal capitalism made tangible, then how can its ‘common sense’ be registered, revised, or resisted? Is the contemporary experienced similarly across the globe, or are its pressure points, modes and sites of dissent different depending on their location? How might we pull on the emergency brake? We are also keen to examine emergent methodologies and debates that offer a barometer of the contemporary in humanities scholarship. For example, how to explicate ‘the contemporary’ is a matter of anxiety for art history: does the term simply denote a period that came after the modern, or were all works of art once contemporary? And what are the conceptual tools and interpretive frameworks we need to study contemporary writing in the present age? As literary scholars have noted, one of the defining features of twenty-first century fiction is the return of the novel about time. How, might we ask, are time and space to be negotiated in an era of transnational literary form and planetary ruination? Finally, we wish also to consider the fate of the humanities, and academic labour itself, inside the contemporary University. The journal invites submissions from postgraduate students and early career scholars that address the theme of the contemporary across the spectrum of Arts and Humanities research. Periodisation and the competing temporalities of ‘the contemporary’ across the humanities: Beyond –modernisms, ‘Post-Post’? Methodological shifts in the humanities: Digital Humanities, Medical Humanities, World Literature, Post-Critical. Tone and the contemporary’s affective intensities: Hope and Pessimism, Anxiety and Belonging. The Anthropocene: Environment and Ecocriticism. Mapping the networks and flows of Late Capitalism and Neoliberalism: Towards a contemporary realism? Contemporary Resistances: Digital Commons, the Hacker, Occupy, Black Lives Matter, Indigenous Social Movements. Human, Non-Human, Post-Human: Artificial Intelligence, Prosthetics, and Augmented Reality; Embodiment and Subjectivity. The Future of the Novel: Transnational, Graphic, Documentary, Historical, Science Fiction. The Production, Philosophy, Criticism, and Curating of Contemporary Art. The Relation between Contemporary Art and Art History. We welcome short articles of 3000-5000 words, long articles of 5000-8000 words and critical reviews of books, film, and exhibitions. We also strongly encourage submissions of artwork including visual art; creative writing; podcasts and video footage (up to 10 minutes). We would be happy to discuss ideas for submissions with interested authors prior to the submission deadline. Please send all completed submissions to mail@dandelionjournal.org by 6th February 2017. Please also include a 50-word author biography and a 200-300-word abstract alongside your submission. All referencing and style is required in full MHRA format as a condition of publication and submitted articles should be academically rigorous and ready for immediate publication. The Dandelion Journal seeks EDITORS to assist in the compiling and editing of the journal’s ‘NOSTALGIA’ issue. As a Dandelion Subeditor, you will be required to edit and copyedit two or three articles (between 3000 – 8000 words) between late-April 2016 and June 2016. We ask that you attend one or two editorial meetings with the rest of the team during this time. You will also be welcome to contribute to the team in any other ways you desire (e.g. events planning, design, typesetting etc). The Dandelion editors seek submissions on the theme of NOSTALGIA for their forthcoming issue. Nostalgia is a ubiquitous presence in contemporary culture. Images and fantasies of the past permeate cultural and political discourses: from the mediated recycling of retro culture and popular history, to nostalgia as a method of political renewal (for example, Donald Trump’s campaign slogan ‘Make America Great Again!’ and Ken Loach’s The Spirit of ‘45). To this end we ask: why the resurgence of nostalgia? Is it merely a displacement strategy for a world convulsed by social, political, economic, and environmental crisis, or is there something salvageable in its longing for a prior wholeness, in its desire to seek out a moment when the new was still possible? Should nostalgia be condemned as an ethical and aesthetic failure? Is nostalgia a hindrance to making it new; a symptom of lateness, of a loss of the future? Or can nostalgia be a productive force that provides, both for the self and society, insights into our present? This journal invites submissions that address the theme of nostalgia across the spectrum of Arts and Humanities research. We welcome short articles of 3000-5000 words, long articles of 5000-8000 words and critical reviews of books, film, and exhibitions. We also strongly encourage submissions of artwork including visual art; creative writing; podcasts and video footage (up to 10 minutes). We would be happy to discuss ideas for submissions with interested authors prior to the submissions deadline. Please send all submissions to mail@dandelionjournal.org by 20th April 2016. Complete instructions for submissions can be found at www.dandelionjournal.org under ‘About’. 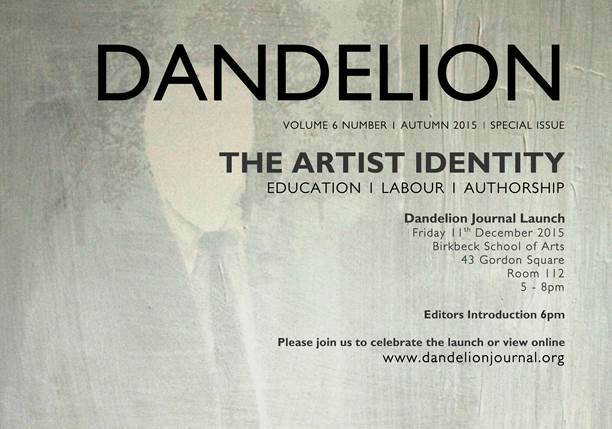 ‘The Artist Identity – Education, Labour, Ownership’ special issue of Dandelion launches this Friday 11th December 2015. You are warmly invited to attend the launch event on Friday 5pm until 8pm, Room 112, 43 Gordon Square. There will be a small reception where the issue will be introduced and where you can meet some of the contributors and editors. The Dandelion editors seek submissions on the theme of ARTIST IDENTITY for their forthcoming issue. A question as simple as asking ‘what is an artist?’ can result in a labyrinth of references, extend to related fields, and lead to contrasting interpretations. This reaffirms the idea that the artist identity is a variable, evolving and adapting representation of the artist’s self. In the symposium that inspired this special issue our speakers added a range of perspectives on the ways in which the artist identity is created, nurtured, sustained and challenged. They also indicated to a need for further investigation of these central themes and a platform for the exchange of these ideas. This special issue aims at encouraging further debate on this notion and invites submissions which engage with questions of artist identity in arts policy and management, in art history, in sociology, in marketing as well as considerations of the notion in public discourse. Our understanding is that an explanation of the concept can lead to an exploration of its explanatory power. We welcome short articles of 3000-5000 words, long articles of 5000-8000 words and critical reviews of books/ films/ exhibitions/ shows. We also strongly encourage submissions of artwork including visual art; creative writing; podcasts and video footage (up to 10 mins), accompanied by a 300-500 word summary/description/analysis. We would be happy to discuss ideas for submissions with interested authors prior to the submissions deadline. We welcome submissions from doctoral students, early career researchers, established academics and independent practitioners, working chiefly within the arts and humanities. Please email submissions by 25th September 2015 to the editors: mail@dandelionjournal.org or submit through the Dandelion website. Please include a 50-word author biography and a 200-300-word abstract alongside your submission. All referencing and style is required in full MHRA format as a condition of publication and submitted articles should be academically rigorous and ready for immediate publication. Complete instructions for submissions can be found at www.dandelionjournal.org under ‘About’. The journal is also seeking for EDITORS to join the Dandelion Journal Editorial Team. If you are interested in exploring this opportunity please email us at mail@dandelionjournal.org. School of Arts, and is supported by Roberts Funding and the Arts and Humanities Research Council. Dandelion aims to bring together a diversity of works from researchers in the arts, to offer collaborative research and training possibilities, and to promote an independent, cross-institutional space for creative professional development.